Matthew's left hand points to his accounts. His right hand points towards himself. The young man at Matthew's left points to a pile of money. The seated older man points to another pile of money. 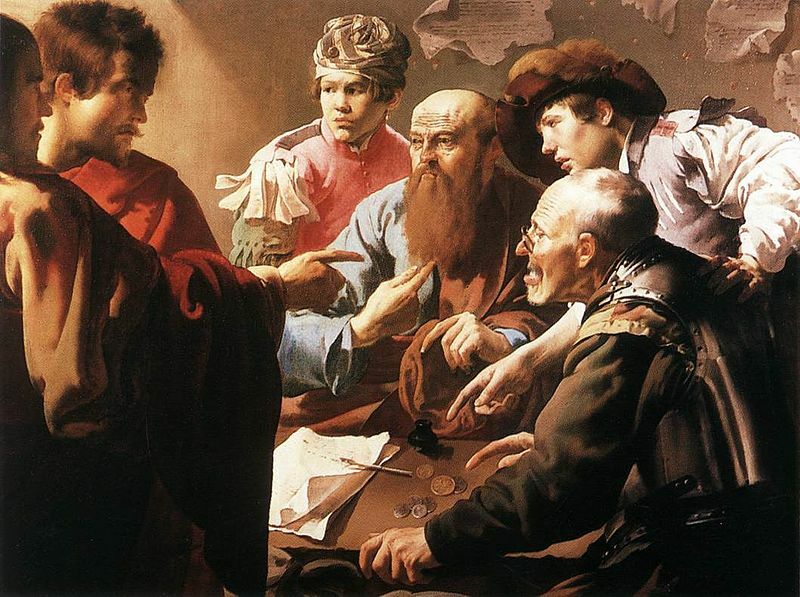 On the left is Jesus, partly in shadow, pointing directly to Matthew as he and Matthew make eye contact. Matthew is the only person in the picture looking at Jesus. There seems to be a struggle going on - a tension between the focus on money and accounts and a conflicting priority emerging within Matthew as a result of his encounter with Jesus. It's a pivotal decision moment - to carry on with corrupt business as usual or to choose a different way. You can read the story of Matthew's call in a few words in Matthew 9: 9 - 13. Last year, in St Matthew's Day Reflection I imagined what went through Matthew's head at that moment when Jesus approached him at his work and called him to follow. What if Jesus interrupted you at your work today? That's one of the questions I asked in Calling. Matthew made his decision. He dropped everything and followed Jesus. Not long afterwards Jesus was heavily criticised by the respectable religious people for enjoying a meal in Matthew's house. Jesus was not as choosy about the company he kept as most of us are. Matthew the tax collector became Matthew the Apostle and found a Wisdom that was more valuable than all the wealth of his ill-gotten gains. See Finding Wisdom on St Matthew's Day.